This line is from the John Denver hit song “Rocky Mountain High” and was reportedly inspired when he and some friends spent the evening in the high Colorado Rocky Mountains (above tree line) staring at the clear night sky, and were captivated by the intensity of shooting stars during the Perseid Meteor Shower. This weekend my bride Ginger, a couple of buddies of ours, and I went camping and fishing up near Steamboat CO. One thing I was looking forward to (in addition to ‘getting away from life’s daily small stuff’) was having opportunity to cross off one of my Photography ‘Bucket-List’ entries. Taking a good star field photo, to include the Milky Way if possible. I had forgotten, until Friday that the annual Perseid Meteor shower was this weekend! We arrived at our campsite Friday evening about 7:30, greeted by a low cloud deck and notification that the local ‘Fire Ban’ had been re-initiated that very day… Meaning no campfires! Ok, that’s like going to a movie and finding out there’s no popcorn! But what option do we have, we’ve journeyed 3 hours to get here, its not like we’re gunna flip a uhey and head back home. We’ll tough it out… and do what I did before during a ‘Fire Ban Camping Trip’… put one of our electric lanterns in the pit and gather around the warmth of a glowing LED! Fortunately gas stoves were not affected by the ban, Beer Brats (and Saturday night’s chicken) were tasty! We were still pretty close to the Steamboat City Limits so every cloud reflected the red-orange glow from the town, still made for some interesting images. The next evening promised clearer skies, so Dan (my fellow photography hobbyist) and I planned for greater opportunity to photograph the star fields arrayed above us. Late Saturday afternoon, we had gone fly fishing on the Elk River, and on our trek to the fishing grounds, we reconnoitered locations for good dark conditions for our expedition. The best we could find (within 20 minutes of our campsite) was a rancher’s field a few miles north. We set up our rigs, set our cameras with the proper parameters necessary for capturing the stars (there’s a lot of technical considerations when doing this by the way), did our best at focusing (not an easy task in low light conditions mind you…) and fired away. Within a couple of minutes of our arrival in the field, the show really began… Intense, long trail, brilliant streaks of light began to sprint across the heavens. The Perseids! Some burned across half the sky! Others dashed like a stone skipping across a pond, it was a sight to behold! and… photograph! If I could! In this first image below, you can see a few (3 actually) streaks just above the ridgeline. Two of these streaks are actually aircraft, the long exposure allowing their anti-collision strobes to form trails in the sky, the third (highest one in the image) is one of the meteors. In another shot, a slightly different angle of that same telephone pole, you can see another couple of meteors (one crossing left to right just above the transmission lines, and the other paralleling the Milky Way just below the transmission lines). The clouds are reflecting the lights of Steamboat Springs to our southeast. And then finally a shot looking at the Southern sky… The lit-up trees are what I presume to be the Rancher’s residence, and the glow off to the right is once again light pollution from nearby Steamboat Springs. Unfortunately all of my drives through said countryside required my attentiveness behind the wheel, and as such did not take any pictures of the lush green woodlands and fields. This first image really challenged my knowledge of the new technology that is Digital SLR Photography. A year or so ago I upgraded my equipment to now include a Nikon D7000 camera. At the time it was the leader in Mid-Level Semi-Pro Camera Bodies. I’ll spare you all of the Marketing Propaganda, but one of the advanced features of this camera is better resolution and less noise at higher ISO Numbers. (In English… The Camera has better ability to process images in low light conditions). 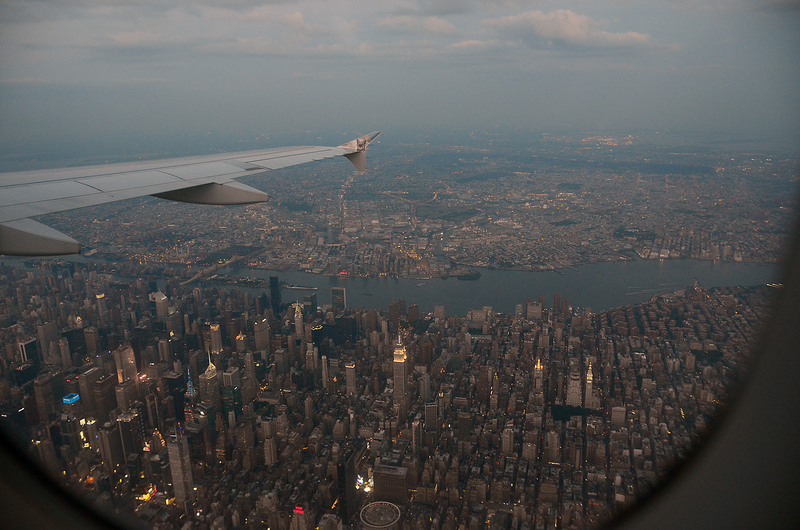 I really tested that ability with this image… This shot was taken from about 1,500 feet over Manhattan as my airplane flew the "’Downwind, up the Hudson” leg of our approach to LaGuardia. This was about 15 to 20 minutes AFTER sunset! The plane is moving along at nearly 250 miles per hour and bouncing a bit. I make the necessary adjustments to the camera (for those who understand camera hieroglyphics: ISO800, 1/60, f3.5, 18mm) and take the shot. 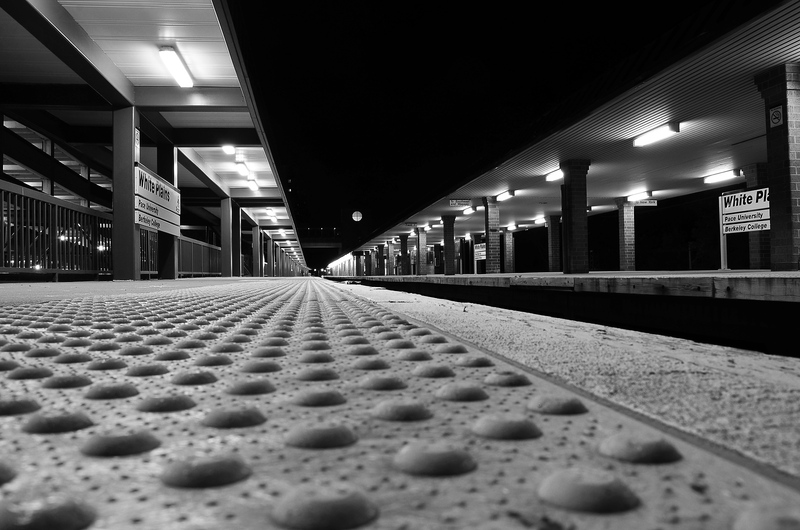 This next one was of the White Plains Train Station, deserted at 10:30pm on Sunday night. I did have my usual allotment of meetings in Manhattan, but those were going to be mostly on Friday. Tuesday was the only evening I had that was “unaccounted for” so I took the liberty of jumping the train from White Plains down to “The City” as it is referred to in the burbs, to see if I could find a way to take photos of landmarks that have already been photographed hundreds of millions of times! I’m sure not one of these images are anywhere near an original photographic idea… but at least I challenged myself to exercise some creativity. Top left is the Empire State Building (duh…) as seen from Bryant Park. 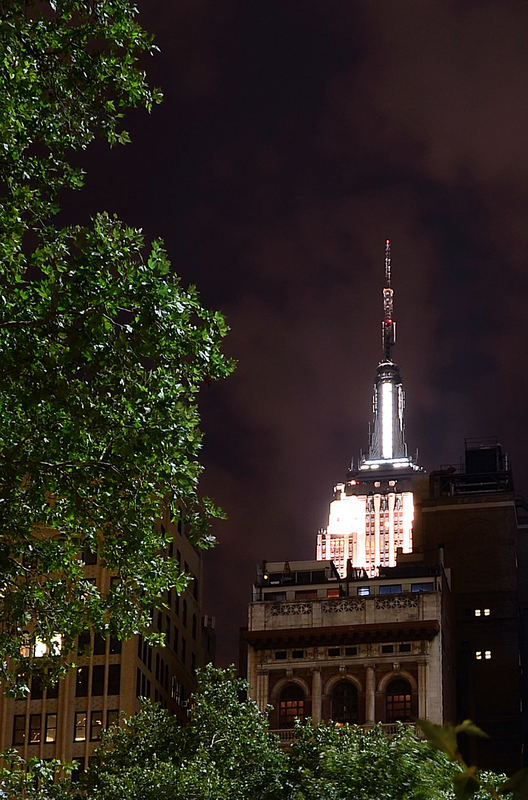 The highlights in the foliage on the left is created by a bank of lights (think night baseball game) shining down on the park from the rooftop of the building at 1095 Avenue of the Americas. Top right is a creative shot I took at Times Square of the 42nd street subway station entrance. Shot with a shallow depth of field and a long exposure. 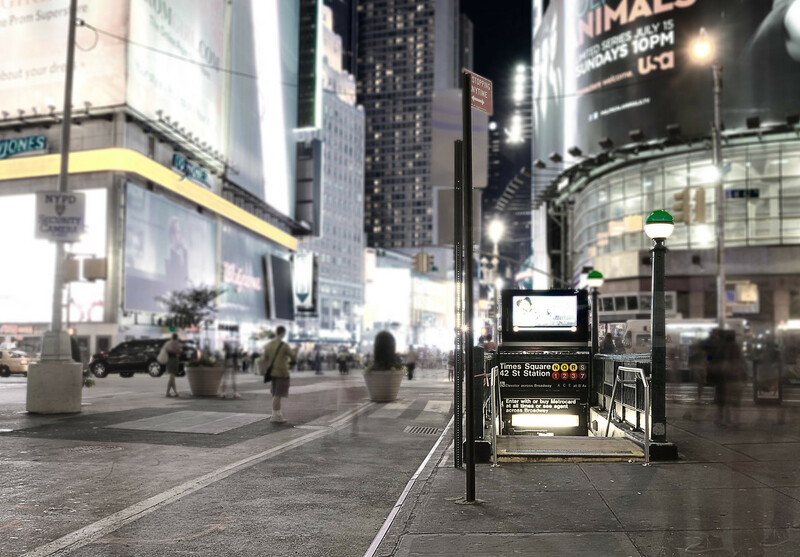 I reduced the color in Photoshop to help draw attention to the subway station. 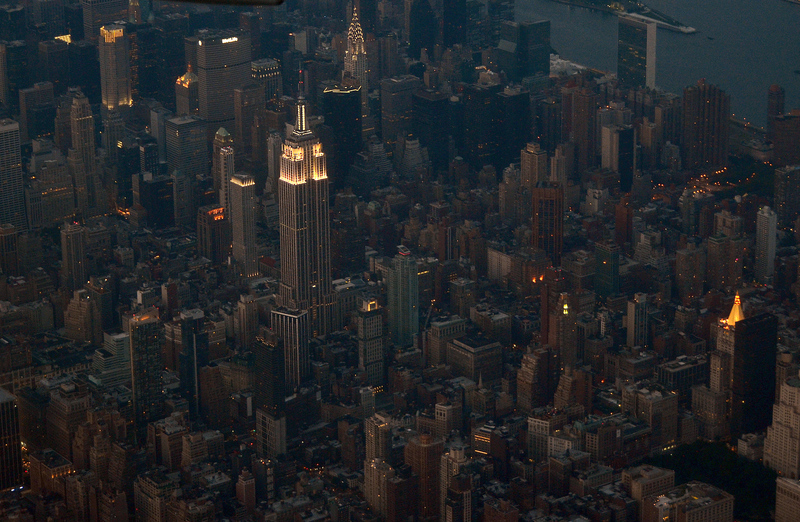 And finally, the bottom shot is of Times Square… probably THE most photographed landmark in NYC. So I tried something different. This shot was achieved by literally placing the camera on the ground! Then executing a long exposure using a wireless shutter release. I love the motion effect of the cabs streaking by, and the spinning sign on the Paramount Theater’s Façade. And there you have it… July in NYC. Duty called and I responded… last week I was in NYC, NJ and the Hudson Valley visiting clients and insuring our company is performing to our clients expectations. We are… of course… we don’t fail in Client Services… at least not on MY watch!!! As is my usual I always have my camera attached to my brief case in case a good photo op presents itself. And New York, for all of it’s many faults, does usually deliver photo opportunities. The question is… do I have the eye at that particular time to recognize it? Or the time to take advantage of the scene before me. Sometimes “yes” sometimes “no”. This trip was not one for too many opportunities. I was on the run constantly. 15 meetings in 4 days will do that to you. But alas I did capture a few. This one was along Park Avenue (quite near the Waldorf) I was actually trying to capture a little bit of the hustle that is New York. 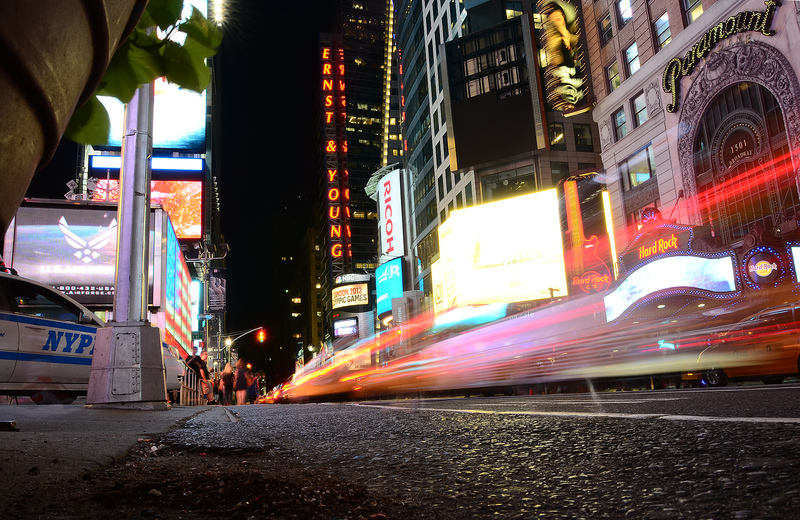 My challenge was to create that feeling using a long exposure to illustrate both the motion and the structure of NYC. I liked how the image conveys the motion of the traffic yet shows that some can take a break in all the bustle. This next one was taken of the Mid-Hudson Bridge in Poughkeepsie New York. Nothing really spectacular about this shot (as it was shot in the middle of the day… not recommended for capturing any emotion in an image) but I was working on capturing a foreground element in a landscape. And finally, the one I like the most. An abstract of 8 Spruce Street. A new tower completed last year by renowned architect Frank Gehry. I often feel its cheating a bit when I take a picture of something that by design is artistic, it’s like painting a picture of a painting… but, to hell with it! How many pictures of buildings have you seen in your lifetime?! There’s a reason they look cool!… So we appreciate them!! !